This recipe came from Jonathan Reynolds of The New York Times Sunday magazine. If you don’t have veal stock, chicken stock will do. 1. Rub salt and pepper on the pork chops. Melt butter in the oil using a deep skillet over high heat. Add the pork chops and brown them on each side for about 5 minutes. Reduce heat if they brown too quickly. 2. Remove chops to a platter and pour off most of the fat. Add shallots and cook over medium-heat until softened. Add wine and bring to a boil, scraping brown bits off the bottom of the skillet. 3. Stir in the veal stock and return the pork chops to the skillet. 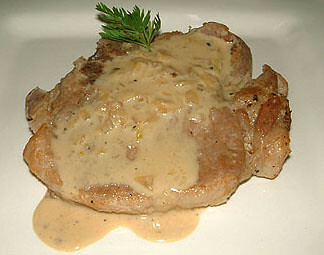 Bring the sauce to a simmer, cover and cook chops until tender, about 25 minutes. Remove chops to a warm platter and tent with aluminum foil to keep warm. 4. Raise the heat and boil juices to reduce to half, about 2 minutes. Add cream and boil for another 2 minutes until sauce thickens. Remove the pan from the heat and whisk in mustard. Spoon over sauce over the chops and serve.